DIRECTIONS: (MAP) From the junction of Rte 1 and Old Creek Road, at the south most traffic light in Cayucos, turn east on Old Creek Road. Go 2.9 miles and take a left (west) on Cottontail Road. Drive about 0.8 miles and park where you get a good view down to the Cottontail Creek Arm of the reservoir. This is all easy birding from next to or from inside the car. BIRDING: A scope is needed for a satisfying look. Both WESTERN and CLARK'S GREBES nest here in high-water years. Migration and winter birding is the most fun, with most of the GEESE, DUCKS and RAPTORS in the county showing up at one time or another. There was a resident pair of (introduced) MUTE SWANS during 2007 and appearing sporadically since then. This arm of the reservoir is the best place (in winter) to see RING-NECKED DUCKS and REDHEADS (rare). It is a long distance for shorebird viewing, even with a scope, but WILSON'S SNIPES, PECTORAL and SOLITARY SANDPIPERS have been seen there. Drive back toward Old Creek Road, stopping at the overlooks on the more eastern Old Creek Arm of the reservoir. The first-described spot tends to be better birding and better lighting, but check this arm also. The county's first REDDISH EGRET was seen here. RUFOUS-CROWNED SPARROWS can often be found up on the steep rocky hillside on the up-slope side of the road. DIRECTIONS: (MAP) Go north on Rte 1 for 0.4 miles from the 1st Cayucos traffic light starting point and turn left (west) toward Studio Drive and then immediately right (north) down into the parking lot. BIRDING: There is usually a pool here at the terminus of Old Creek. It is one of the best places in the county for good looks at TERNS, both ROYAL (Aug-April) and ELEGANT (July-Nov). Also an excellent spot for winter GULLS and SHOREBIRDS: SNOWY, SEMIPALMATED and BLACK-BELLIED PLOVERS, WHIMBRELS, and others that frequent the sand beach area. Easy birding from the parking lot. DIRECTIONS: (MAP) Go north on Rte 1 for 2.0 miles from the 1st Cayucos traffic light starting point and exit Rte 1 at Cayucos Drive. Turn left (west) on Cayucos Drive. At Ocean Ave (the main street through town) take a right (north) and then an immediate left (west) into a parking lot. BIRDING: Check the pool at the river mouth for GULLS and SHOREBIRDS. Excellent location in winter to see RUDDY and BLACK TURNSTONES and SURFBIRDS on the rocks to the north. Walk a few hundred feet south to the pier. The pier sometimes allows close looks at SCOTERS, TERNS, and sometimes SOOTY SHEARWATERS. DIRECTIONS: (MAP)(Detail MAP 4) Estero Bluffs State Park is a mostly unpublicized coastline starting north of Cayucos and extending 3 miles up the coast to where the ocean can no longer be seen from Rte 1. It can be accessed from about 6 major pull-offs / parking areas along Rte 1, each with trails going to the water. Although extensive work was done on most of these pull-offs in 2013, some dirt areas can be very muddy and slippery during wet weather. There is an informal, generally flat, and well-established bluff trail. BIRDING: To bird the entire length of the trail and back would be about 7 miles. Most birders prefer to do a shorter distance, concentrating on one of the most varied and productive habitats listed below. "The Windmill" / San Geronimo Road parking area: The second parking lot, 0.5 miles north of where northbound Rte 1 becomes single-lane. Bird the weedy area inside the fence and over to the small riparian area for SPARROWS and WARBLERS, then work down to the water. At the water check the sandy beach, then cross the beach and up onto the bench. This crossing requires a short steep descent and ascent. High tides or stream flow may block this route. The trail follows the edge to a rocky point, sometimes still called "Cypress Point" for the single cypress that used to be near the point, but has since been cut down. North of this rocky point to the next point to the north is one of the most productive areas. The rocks off the point are excellent for all three CORMORANTS, ROYAL and ELEGANT TERNS, BLACK OYSTERCATCHERS, SURFBIRDS, TATTLERS, etc. BLACK TURNSTONES are common on the rocks and in the kelp along the beach. This is probably the best location in the county to look for RUDDY TURNSTONES (winter, uncommon but regular). Look for SCOTERS, any of the wintering GREBES, HARLEQUIN DUCKS (1 or 2 often winter here or in similar habitat up the coast). Look for ALCIDS in fall and winter, especially MARBLED MURRELETS (uncommon). SAVANNAH (common) and GRASSHOPPER (regular but less common) SPARROWS breed in the grassy fields. Many years CASSIN'S KINGBIRDS nest in the eucalyptus near the windmill. "The Fig Tree" parking area: The third parking area (1.0 mile north of where northbound Rte 1 becomes single-lane and 0.5 miles past "The Windmill") is named for the single and remarkably large fig tree at the trailhead. There is a short set of high stairs down a short steep banking at the start of this trail, then, it is generally flat. Through the fence fork left and walk to the shore. You are then at the rocky point ("Cypress Point") referenced in #1. Birds as above. "The Villa Creek" parking area: The fifth parking area is 1.75 mile north of where northbound Rte 1 becomes single-lane and 0.75 miles past "The Fig Tree" area. There is a short but steep banking at the start of this trail, then it is generally flat except for one short down / up banking to cross a gully. The birding is in general not as good along this section. The goal is to walk north along the coast until the trail enters a short sand beach. This is a SNOWY PLOVER nesting area. When fencing is not up, the driftwood / weedy area has good potential for migrant and wintering SPARROWS and perhaps a rarity. Approach the creek mouth pools slowly and look for SHOREBIRDS; some of the more uncommon species have been seen there. Round trip from the parking area to Villa Creek and back is about 2.4 miles. Any parking area along Route 1 where there is an open gate also gives access to the shore. DIRECTIONS: (MAP) Drive north from Cayucos about 13-14 miles to Cambria. At Windsor Blvd, the forth traffic light along Rte 1 in Cambria, turn left (west) and continue on Windsor Blvd. BIRDING: There are two areas of interest here, the creek bed and the creek mouth. For the Creek Bed: cross the bridge and park on the left at a small waste treatment facility. Walk the trail that follows the creek edge upstream (south) until it starts up a hill. Check the willows for migrant / wintering WARBLERS. The creek bed is generally dry during fall migration, or has small areas of standing water, allowing one to walk down steam in the streambed almost to the ocean. In winter and in spring migration the creek bed is usually impassable due to flowing water. The willows along the edge have produced many "good" warblers, but access is difficult. The dense willows and cottonwoods on the north side of the road from the parking area is also good, but hard to access. Note: There are sometimes homeless persons camped in the creek bed. For the Creek Mouth: After you turn left off of Rte 1 at the traffic light, immediately turn right (north) onto Moonstone Beach Drive. In 0.4 miles, turn left (west) down a short entrance to a parking lot (with restrooms). Check the creek mouth pool for DUCKS and GULLS. Check the rocks off shore and the beach. DIRECTIONS: (MAP) About 2 miles north of the last traffic light in Cambria (see #A-5) on Rte 1, just before the San Simeon Creek bridge, take a right (east) into the Washburn Day Use Area (marked A6 on the map). BIRDING: A trail starts on the boardwalk. Go left to check the creek area under and just upstream from the bridge. Then walk the other way on the boardwalk to another bridge and check the riparian area. Flat. Easy access for all. There are several trail options from there as shown on the map. The trail loop marked in pink on the map is about 3.5 miles long. It takes one through grassland, oak, pine, riparian and coastal scrub habitats. The trail goes up and down several slopes and has several rather high steps. It is good birding in any season. The areas of pines (marked in yellow on the map) are perhaps the most interesting. PYGMY NUTHATCHES are common there, along with RED-BREASTED NUTHATCHES, BROWN CREEPERS and a variety of WOODPECKERS. WILSON'S WARBLERS, SWAINSON'S THRUSHES and PACIFIC SLOPE FLYCATCHERS breed in the willow area. DIRECTIONS: (MAP) Same as #A-6 but drive north over the Rte 1 San Simeon Creek bridge and park on the ocean side. BIRDING: The pond at the creek mouth can have an excellent variety of SHOREBIRDS, DUCKS, GEESE and GULLS during migration and in winter. The beach proper is good for the large and the small PLOVERS. DIRECTIONS: (MAP) Drive north from #A-7 for 0.2 miles and take a right (east). Drive 0.3 miles, just past the campground entrance, and take a right on a small road and park. There is a pond located just east of where you are parked. BIRDING: The pond was hard to see through the pines and brush, but was worth checking for vagrants. As of 2010 it appears to be permanently dry. DIRECTIONS: (MAP) From #A-8 continue north on Rte 1 for another 1.5 miles. Just before crossing a major bridge turn left (west) on Pico Ave and park at the end. BIRDING: Walking 100 feet north takes one down a slope to a small beach, a weedy area and pools at the mouth of the creek. Drive back to Rte 1 and across it to east Pico Ave. Park on the left and walk up the street. The pines can be good for migrating warblers. Stay on the street. This is private property. DIRECTIONS: Along the coast north of #A-9 the fields on the east side become more extensive. BIRDING: These pastures are excellent for raptors in winter. One of the better places to look for GOLDEN EAGLES and FERRUGINOUS HAWKS. DIRECTIONS: (MAP) Along Route 1 about 0.7 miles north of the Pico Creek Bridge there is a "Vista Point" parking area (mile post 55.5) on the left (west) side of the road. There are also two more Vista Points in the next mile or so north along Route 1. BIRDING: All 3 vistas are excellent spots to scan the rocks for rock-loving SHOREBIRDS and for SEABIRDS. DIRECTIONS: (MAP) A few miles north of Pico Creek, at the main Hearst Castle exit off Rte 1, turn left (west) and then immediately left again into the William Randolph Hearst Memorial State Beach (w/restrooms) and park. BIRDING: The bay can be scoped from the end of the pier for GREBES and SCOTERS. This bay is one of the better places to look for MARBLED MURRELETS (rare) in any season. PIGEON GUILLEMOTS nest under the pier. This is an excellent place to see them up close and to photograph them. Accessible to all. Driving out of the parking lot, turn left (north) on SLO San Simeon Road and stop at the bridge. Check the little pools there for MIGRANTS. Check the red-flowering eucalyptus trees along the road just north of the bridge for HUMMINGBIRDS, ORIOLES and other nectar-loving birds. Easy access to all. Continue north on this road to re-join Rte 1. DIRECTIONS: (MAP) About 2 miles north of the Hearst Castle exit Rte 1 crosses Arroyo Laguna Creek (mile post 59.9). Pull well off the road just north of the bridge and park. Easier parking southbound; access to all..
BIRDING: Check the creek from the bridge. West of the bridge is a long narrow pond that should be checked for vagrant DUCKS and SHOREBIRDS. DIRECTIONS: (MAP) Drive north from #A-13 another 1.3 miles (mile post 61.2) and park in the Vista Point parking area on the left (west) side of Rte 1. It is called "Cypress Tree" Vista by locals for the obvious small group of Monterey cypress at the south end of the lot. BIRDING: A good vantage point to scope the rocks for rock-loving SHOREBIRDS and to look for HARLEQUIN DUCKS (rare, winter) and other SEA DUCKS. Access to all. DIRECTIONS: (MAP) Drive north on Rte 1 for another mile north of #A-14 and park in the large parking lot of this major tourist attraction. In winter (peaking in January) hundreds of elephant seals use this beach as a birthing and breeding spot. Access to all. BIRDING: In winter, gulls are attracted by the "afterbirth" from the seals and go into a "feeding frenzy" at each birth. One of the better places in the county to look for GLAUCOUS-WINGED, MEW (both fairly common in winter), HERRING (uncommon) and GLAUCOUS GULLS (rare) in winter. DIRECTIONS: (MAP) From #A-15 drive north on Rte 1 for another 0.3 miles and park in the lot on the west side of the road. BIRDING: Go through the gate at the north end of the lot and walk the trail north along the coast. 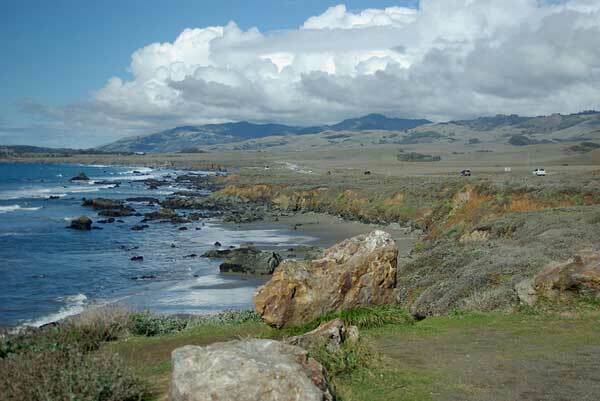 In about 0.2 miles you are opposite the large "whitewashed" rock that is Piedras Blancas. There was a BROWN BOOBY on the rock for a few weeks one winter. 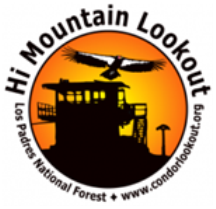 "SEAWATCH BIRDING" can be great from here and other points north along the trail. Piedras Blancas Light Station is now opened to the public. Birding is best in the morning for both lighting and wind; afternoon winds can get fierce. The scenery is spectacular! The trail is narrow, but generally flat. DIRECTIONS: (MAP) (Detail MAP 17) From #A-16 drive north on Rte 1 for another 4.2 miles and park off the road just north of the high bridge. BIRDING: Scan up and down from the bridge. Walk down the short, but steep, rocky, and slippery, trail at the northwest end of the bridge. At the bottom, follow the little-used flat and easy-walking trail at the willow-meadow border. Bird the willows for MIGRANT PASSERINES. This meadow is filled with weeds and is a wetland at the far side; the kind of place where anything could show up! Just past the abandoned tractor bear left into an opening and find a very obscure opening into the willows at the far west end. This part through the willows is tough walking due to overhanging branches. In a few hundred yards the trail emerges into the open. Bird the creek-mouth pools, beach and willows. DIRECTIONS: (MAP) From #A-17, drive north on Rte 1 for another 4.4 miles and park off the road. BIRDING: Check the creek from the bridge and then follow a trail that leads to a seasonal lagoon and the beach. Rare fall migrants including REDDISH EGRET, BLACK-AND-WHITE WARBLER, and SUMMER TANAGER have been found here. This area is not birded that often, but the habitat and access are there. DIRECTIONS: (MAP) (Detail MAP 19) From #A-18 drive north on Rte 1 for another 1.5 miles and park at the last parking area of the Ragged Point Inn. BIRDING: The small waterfall that flows off the cliff just north of the inn is the only place in the county known to have nesting BLACK SWIFTS. The waterfall area can be viewed from the trail to the end of the point. About 0.5 miles round trip loop on gently sloping paved trails. Early morning and evening are best, since they generally feed high in the hills or just high in the sky during the day. The tall cypress trees by the road are good for OLIVE-SIDED FLYCATCHERS and PURPLE FINCHES (summer).